THE scenarist’s dream of New York City in 1980 has been done in miniature at Hollywood for “Just Imagine,” a motion picture fantasy. This model took five months to complete and cost approximately $200,000. It was built in an old blimp hangar once used by the U. S. Army balloon corps and covers a ground area 75×225 feet, representing the most extravagant effort yet conceived by the American cinema industry. Lofty office buildings 250 stories high, canals carried overhead on suspension cables, airplanes that land on a few square feet of flat space on the side of tall structures, streets with nine lanes and nine levels of traffic, are among the interesting features. Although the model city is futuristic, its construction violates no engineering practices. 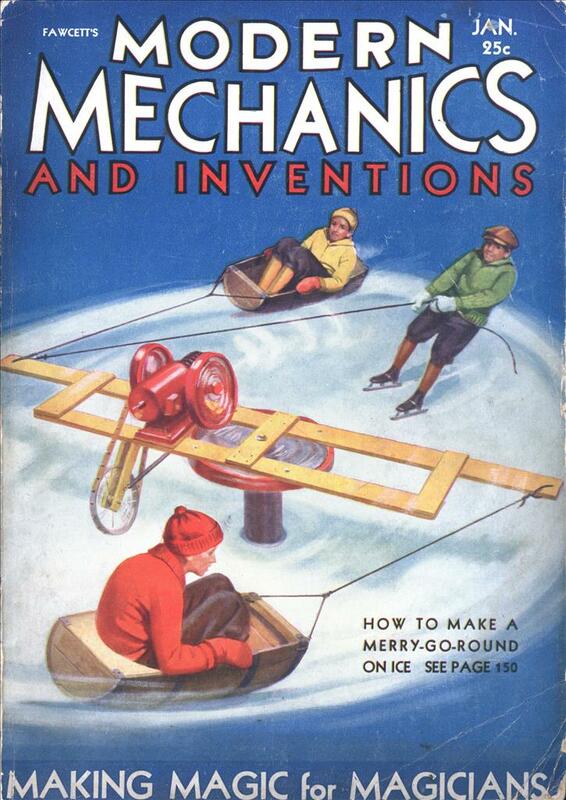 It is really engineering skill carried a bit farther than today. A crew of 200 technical experts and artisans moulded and built the miniature, which is raised on a platform above the ground. More than five tons of plaster, to say nothing of hundreds of pounds of lumber, glass and other materials, were employed in this “giant” miniature, the tallest tower of which is 40 feet high â€” which would be close to 2000 feet in actuality. The model is built to a scale of one-fourth inch to one foot. The utmost fidelity to truth was observed in making this set. No details of exterior construction were left undone. Even real glass was used for windows, and the plaster was colored just the same as in real structures. In this case I think the article is wrong. This is Fritz Lang’s Metropolis set (have a poster of that set/effect on the wall) – and he lived in Germany until 1933 if I remember correctly. Seeing how Metropolis was made in 1927 this has nothing to do with Hollywood. If only there were a website that described the futures that might have been. @dubqnp: Are you sure that the poster you have isn’t wrong? This set does not look like Metropolis to me (though it does look Metropolis-inspired), and I’ve seen the movie a good dozen times, at least. Where is Fredersen’s main tower, the centerpiece of Metropolis? Where is the Yoshiwara district? And the streets are elevated in Metropolis, they aren’t on the ground (and definitely not as wide as this article shows). I personally think the article is right, but I would love to see the poster you’re referring to. Well, I wouldn’t say they cheated you. The creators of the poster may have not known better. I’ve seen film studies professors mix up “Metropolis” and “Just Imagine” many times before because, with the exception of the miniatures, “Just Imagine” is just a bad movie and very easily forgotten. So, when presented with a sprawling urban landscape from the late 1920s and early 1930s, we immediately think of “Metropolis” and Lang. I’ve even seen respected academic books refer to shots from “Just Imagine” as shots from “Metropolis,” so I wouldn’t blame the creators of the poster. That said: I do love this set. The design comes from 1922 and had been worked on as a plan of New York since the 1916 zoning law went into effect, when Metropolis was only a glimmer in Thea Von Harbous eye. It was a working piece between three men over the course of nearly a decade; Raymond Hood, Harvey Wiley Corbett, and Hugh Ferriss. However the design of a multi-tiered street system fell out of favour due to manpower, and the Great Depressions money constraints [even though we could use it here in Manhattan today]. It still was the most futuristic thing of its time. Ferrissâ€™s dramatic charcoal renderings of a city of vast multi-block megastructures, set at intervals in separate zones of Science, Art, and Business, were widely published in the late twenties and, more than any other source, defined the image of the possible urban future in American popular culture. Your poster may have the word ‘metropolis’ on it, but to be sure, it is not the same as the film “Metropolis”. That word was being bandied about constantly then [also, if I may add, pics or it didn’t happen]. All of “Metropolis'” sets had been designed with very narrow canyons between buildings to maximize the effect of viewing tall buildings and were mostly four times the height of a human being. “Metropolis” also had no sets like the above ones used for “Just Imagine” and likewise in reverse. The “Just Imagine” set was designed with the New York Zoning Law 1916 in effect. “Just Imagine needed a large, less narrow, miniature to achieve it’s flying shots. 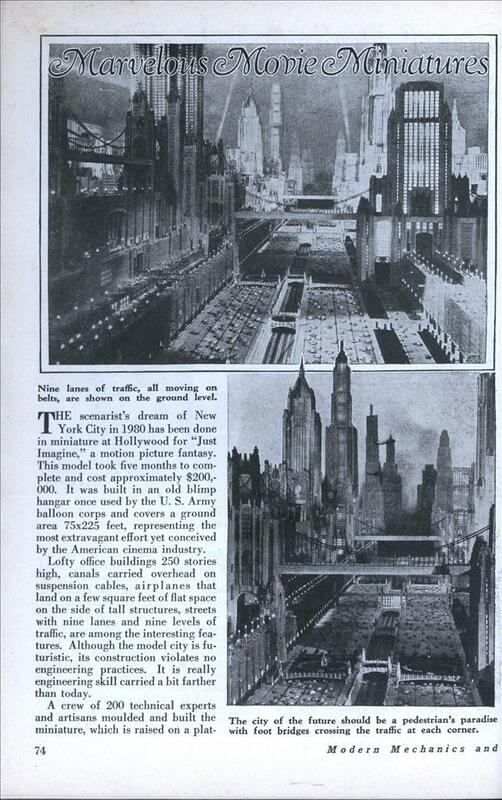 “Metropolis” has no fly-over shots over the city and “Just Imagine” absolutely did have them. Any miniature from “Metropolis” would have been counter to what was needed for filming “Just Imagine”. The Zoning Law meant buildings have to have a certain set back from the street depending on height, which most achieved by the stepping at the heights of the buildings to maximize the usable space and to allow for sunlight. Hugh Ferris was a master at this and inspired many of the great architectural wonders of modern and past Manhattan. The poster may have be OF a Future metropolis, not FROM Metropolis(tm). PS: Just now recognised the symetry of your screenname. Too bad you can’t make it spin. And the real unanswered question is, whatever happened to this model? It seems a pity that it should have been destroyed. I have the same poster. It’s cropped to the first image in the article with “Marvelous Movies Miniatures” written on it. I’ve seen Metropolis, but I never thought that the two had more in common than their color palette. Always assumed the poster was just a BS model. It’s kinda neat to know the story behind it now. Buster Crabbe ‘Buck Rogers’ serials? The US military probably needed the blimp hangar back as WWII neared. and filmed with high speed cameras. ATOMIC BOMBS DESTROY 1999 NEW YORK CITY! Jayessell: Yes, some of the stuff from Just Imagine was reused. Architectural styles are different, as is the ‘feel’ of the cities. PS: Thanks for posting this. It’s so hard to find info or pics from Just Imagine. Damn shame, too, as it looks beautiful and seems to have had decent production values. @Mike: It’s been close to 20 years since I’ve seen any of “Just Imagine” (we saw some of it in a film class back in college). It does run on cable from time to time, so you might want to set up a DVR to look for it. Let’s just say that I, for one, am glad the sci-fi musical comedy never managed to take off as a genre. Yes, the city appears in the 1939 Buck Rogers serial. Geoffrey, would you say that “Just Imagine” was the best Sci-Fi Musical EVER!! ? If one has to make an absolute statement about it then, yes, I would have to say it was the best one. EVER! And, while I was tempted, none of those links have Rick Astley in them (though you will wish they did). I’d never seen that opening scene one before. The picture frome the article is definetely fromFritz Langs “Metropolis”. I have checked it against the film and the making of. Maybe the text is describing a different set, but the picture model is from Germany. @JÃ¶rg: Which scenes would those be? Especially since we’ve already verified the article is about “Just Imagine” and its sets, not “Metropolis.” Lang would have never built his sets in the US until after he fled the Nazis and he came to Hollywood. Or in this case, the downloadable mp4. of the future is absent. you DO see the city! yo, this post was great to go through, im a film student and im trying to write an essay on miniature film sets and what inspired the makers of them, but its realy difficult to get information, do any of you guys no of any other sites or sources of information on the subject? Just Imagine is an interesting film, but not a good one. The script and acting are poor, with the former meandering all over the place. While one can also fault Metropolis’ hammy acting, I think it’s the film’s monumental treatment of cosmic issues that struck a chord with viewers then and still affects us now. Just Imagine simply goes for harmless contemporary jokes of the sort that filled the pre-pictorial Life magazine: pokes at prohibition, women’s fashions, gender reversal, etc. Considering the money and effort that went into the city model, I was surprised to find the rest of the production values quite low…the ground-level city sets, especially, were sparse almost to the point of Monogram. Maybe they blew all their dough on the miniatures.